Lower right: "La Marquesa de / S.n Tiago Goya 1804"
The Marquesa de Santiago stands full-length in front of a landscape of gently sloping hills. Well-born, very wealthy, and a commanding presence, she confronts the viewer directly. Her white lace mantilla extends to her knees, and she holds a closed fan in her left hand. Heavily applied make-up accentuates her features. Known for her dissolute lifestyle, the Marquesa died at the age of forty-three, three years after this portrait was made. An English visitor to Spain once described her as "very profligate and loose in her manners and conversations, and scarcely admitted into female society and said to boast of her nocturnal revels." While contemporary portraitists sought to convey ideal beauty through a highly finished technique, Goya used a more expressionistic handling of the paint. Broad, quick brushstrokes describe her dark dress, and the application of thick impasto suggests the gold braid on the Marquesa's sleeve and the lace of her mantilla. In the background, crude cottages and trees are merely indicated with wide, rapid sweeps of the brush. José María Magallón y Armendáriz, marqués de San Adrián, died 1845 (Madrid, Spain) and María de la Soledad Rodríguez de los Ríos, marquesa de Santiago, 1764 - 1807 (Madrid, Spain), commissioned from the artist, 1804; by inheritance to her son (and his stepson) by her first marriage, Antonio María Bernaldo de Quirós Monreal, marqués de Santiago, 1807. Antonio María Bernaldo de Quirós Monreal, marqués de Santiago, died 1836 (Madrid, Spain), by inheritance within the Santiago family. José Mesia y Gayoso, fourth duke of Tamames, died 1917 (Biarritz, France), by inheritance to his wife, Maria de Galisteo, 1917. Maria de Galisteo, eighteenth duchess of Tamames (Biarritz, France), sold to a private collector, about 1930. Private Collection (Switzerland), consigned to Harari and Johns, by 1982; half-share sold to Artemis Fine Arts Ltd., by 1982. Private Collection (Switzerland) and Artemis Fine Arts Ltd. (London, England), sold, through Harari and Johns (London, England) and Eugene Thaw (New York, New York), to the J. Paul Getty Museum, 1983. Viñaza, Cipriano Muñoz y Manzano de la. Goya: Su tiempo, su vida, sus obras (Madrid: Tipografía de Manuel G. Hernández, 1887), p. 268, no. 134. Illustrierter Katalog der VI. Internationalen Kunst-Ausstellung 1892 im Kgl. Glaspalaste, exh. cat. (Munich: Verlagsanstalt für Kunst und Wissenschaft, 1892), p. 30, no. 646c. Lafond, Paul. Goya (Paris: Librairie de l'art ancien et moderne, 1902), p. 137, no. 208. Calvert, Albert F. Goya: An Account of His Life and Works (London and New York: John Lane, 1908), p. 140, no. 230. Stokes, Hugh. Francisco Goya: A Study of the Work and Personality of the Eighteenth Century Spanish Painter and Satirist (London: H. Jenkins, 1914), p. 246. Beruete y Moret, Aureliano de. Goya, pintor de retratos (Madrid: Blass, 1916), p. 176, no. 168. Loga, Valerian von. Francisco de Goya (Berlin: G. Grote, 1921), p. 202, no. 330. Beruete y Moret, Aureliano de. Goya as Portrait Painter. Selwyn Brinton, trans. (Boston: Houghton Mifflin, 1922), p. 210, no. 176. Zapater y Gómez, Francisco. Colección de cuatrocientas cuarenta y nueve reproducciónes de cuadros, dibujos y aguafuertes de Don Francisco de Goya [...] (Madrid: Editorial "Saturnino Calleja," 1924), p. 476, no. 152, ill.
Mayer, August L. Francisco de Goya. Robert West, trans. (London and Toronto: J. M. Dent & Sons, 1924), p. 166, no. 417, pl. 155. Desparmet Fitz-Gerald, Xavière. L'Oeuvre peint de Goya: Catalogue raisonné. 2 vols. (Paris: F. de Nobele, 1928-50), vol. 2, p. 180, no. 467, pl. 386. Desparmet Fitz-Gerald, Xavière. L'Oeuvre peint de Goya: Catalogue raisonné. 2 vols. (Paris: F. de Nobele, 1928-50), vol. 1, p. 36. Gassier, Pierre, and Juliet Wilson. Vie et oeuvre de Francisco Goya (Fribourg: Office du Livre, 1970), pp. 253, 261, no. 879, ill.
Gudiol, José. Goya, 1746-1838: Biography, Analytical Study and Catalogue of His Paintings. Kenneth Lyons, trans. 4 vols. (Barcelona: Ediciones Poligrafa, 1971), vol. 4, pp. 728, 730, figs. 886, 888. Gudiol, José. Goya, 1746-1838: Biography, Analytical Study and Catalogue of His Paintings. Kenneth Lyons, trans. 4 vols. (Barcelona: Ediciones Poligrafa, 1971), vol. 1, pp. 141-42, 147, 314, no. 549. Gassier, Pierre, and Juliet Wilson. The Life and Complete Work of Francisco Goya, with a Catalogue Raisonné of the Paintings Drawings and Engravings (New York: Reynal & Co., with William Morrow & Co., 1971), pp. 253, 261, no. 879, ill.
Angelis, Rita de. L'Opera pittorica completa di Goya (Milan: Rizzoli, 1974), pp. 121-22, no. 480, ill.
Salas, Xavier de. Goya. G. T. Culverwell, trans. (London: Studio Vista, 1979), p. 193, no. 436, ill.
Camón Aznar, José. Fran. de Goya. 4 vols. (Zaragoza: Caja de Ahorros de Zaragoza, Aragón y Rioja, 1980-82), vol. 3, p. 171. "Acquisitions/1983." The J. Paul Getty Museum Journal 12 (1984), pp. 315-16, no. 20, ill.
Fredericksen, Burton B. "Goya's Portraits of the Marqueses de Santiago and de San Adrián." The J. Paul Getty Museum Journal 13 (1985), pp. 133-40, figs. 2a-c.
Glendinning, Nigel. "Goya's 'Portrait of the Marquesa de Santiago'." The J. Paul Getty Museum Journal 13 (1985), pp. 141-46. Sayre, Eleanor. "The 'Portrait of the Marquesa de Santiago' and Ceán's Criticism of Goya." The J. Paul Getty Museum Journal 13 (1985), pp. 147-49. Fredericksen, Burton B. "Goya's 'Portrait of the Marquesa de Santiago': A Correction." The J. Paul Getty Museum Journal 14 (1986), p. 151. Glendinning, Nigel. "A Footnote to Goya's 'Portrait of the Marquesa de Santiago'." The J. Paul Getty Museum Journal 14 (1986), pp. 149-50. Fredericksen, Burton B. Masterpieces of Painting in the J. Paul Getty Museum. Rev. ed. (Malibu: J. Paul Getty Museum, 1988), unpaginated, no. 49, ill.
Glendinning, Nigel. Goya: La década de los caprichos; Retratos 1792-1804, exh. cat. (Madrid: Real Academia de Bellas Artes de San Fernando, 1992), pp. 103, 125, no. 26, ill.
Fernández, Luis Alonso. "Dos retratos de Goya separados por la historia: El marqués en Pamplona y la marquesa en Malibú." Reseña 30, no. 236 (February 1993), pp. 44-45, ill.
Jaffé, David. Summary Catalogue of European Paintings in the J. Paul Getty Museum (Los Angeles: J. Paul Getty Museum, 1997), p. 56, ill.
Brejon de Lavergnée, Arnauld, et al. Goya: un regard libre, exh. cat. (Lille: Palais des Beaux-Arts; Réunion des musées nationaux, 1998), pp. 193-95, no. 34, ill., entry by Jean-Louis Auge. Gerard-Powell, Véronique. "Goya portraitiste." In Goya: un regard libre, exh. cat. Arnauld Brejon de Lavergnée, et al. (Lille: Palais des Beaux-Arts; Réunion des musées nationaux, 1998), p. 70. Gerard-Powell, Véronique. "Goya: un regard libre." L'Estampille / L'Objet d'art, no. 331 (January 1999), pp. 22, 29, ill.
Rishel, Joseph J., et al. Goya: Another Look, exh. cat. (Philadelphia: Philadelphia Museum of Art, 1999), pp. 39, 44, ill., text by Joseph J. Rishel. Serraller, Francisco Calvo, et al. Goya: La imagen de la mujer, exh. cat. (Madrid: Museo Nacional del Prado, 2001), pp. 260-61, no. 69, ill., entry by Anna Reuter. Ribeiro, Aileen. "La moda femenina en los retratos de Goya." In Goya: la imagen de la mujer, exh. cat. Francisco Calvo Serraller, et al. (Madrid: Museo Nacional del Prado, 2001), pp. 112-13. Ribeiro, Aileen. 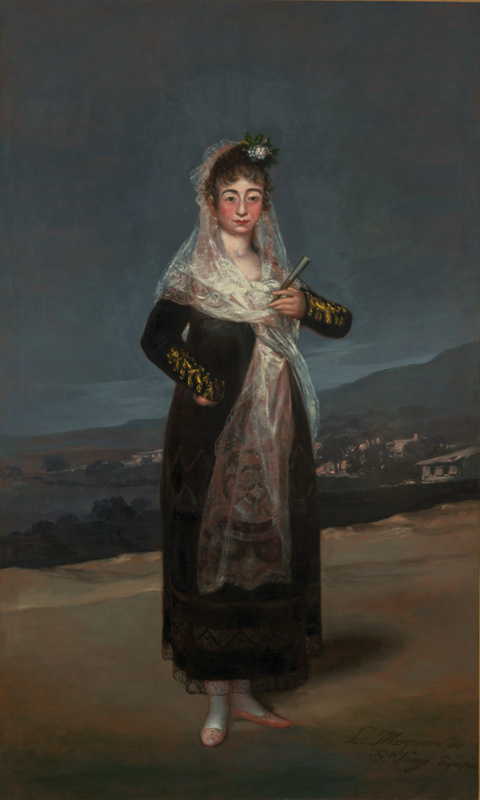 "Fashioning the Feminine: Dress in Goya's Portraits of Women." In Goya: Images of Women, exh. cat. Janis A. Tomlinson, ed. (Washington, DC: National Gallery of Art, 2002), pp. 82-83. Mena Marqués, Manuela B. "La Mirada de Goya: Retratos Innovadores Para Personajes de Excepción." in Goya: Retratos de Vascos y Navarros, exh. cat. Manuela B. Mena and Gudrun Maurer, eds. (Bilbao: Museo de Bellas Artes de Bilbao, 2018), p. 31, ill.
Students write descriptions and use a variety of media to create portraits of characters from the fairy tales of Hans Christian Andersen. Students spend more time looking at details and write an imagined interview with a sitter.